The dictionary meaning of accommodation is to adjust according to a particular situation or circumstance. Accommodation is another word for settlement for the convenience of a person. In the corporate world, workplace accommodations refer to the settlement or a service provided to the employees by the employer for better health and productivity in the workplace. However, this is not provided to everyone. It varies from person to person depending upon the need of the service and sources of the employer. With that being said, it is understood that for workplace accommodations one needs to approach the employer with the problem. If the employer feels that the problem is reasonable, he or she may provide a reasonable accommodation. The word reasonable refers to a sound or fair thing. Therefore, reasonable accommodation refers to a reasonable grant to any employee who is suffering from any problem. However, the employee must be qualified enough for the job and should promise a quality work as soon as he or she is granted a reasonable accommodation. A reasonable accommodation is an indirect aid to a qualified applicant for performing important tasks in the workplace. Moreover, it also includes equal rights and privileges for all the employees regardless of the ability and disability. 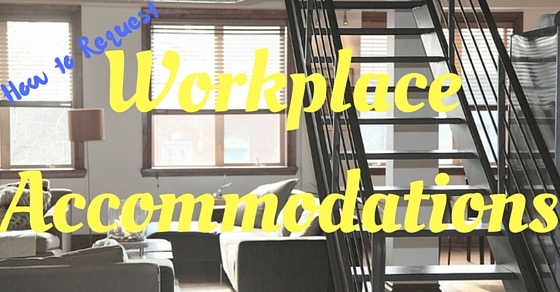 What Type of Workplace Accommodations can you Request For? Of course, no one would like an employee taking several breaks during the working period. Working is clearly associated with productivity at every minute. Imagine that yourself as a lucky person who ended up getting a humble and understanding employer. He has scheduled a 15-minute break at 10:30 am every day. However, at 10:30 am you hardly felt any need for the break. Thus, you waited patiently for the 15 minutes to end in order to resume the work. At 11:30 am you suddenly get a panic attack or a minor headache. However, you had already taken a 15-minute break at 10:30 am; as a result, you could not take another break at the time of need. At times like such, you definitely would wish for a flexible break schedule. For such a problem you may appear in front of your employer with your request. This might even come off as helpful for the rest of the staff. ‘9 to 5’ is the show time for the office going staff. As a fact, it is the show time of most of the people. Doctors, corporate workers, teachers, etc. work during the same time period. Imagine that you need to consult a doctor regarding your constant back pain. You search for a good doctor and come across one successfully. However, the doctor’s consulting time is between ‘10 to 4’. At times like such it becomes difficult to visit a doctor as a result you keep postponing the appointment. This may not only worsen the problem (in this case the ache) but also creates problem during the office hours which may deteriorate the productivity level. At times like such you may appear in front of your employer with your request. You may settle for flexible working hours in which you may work exactly the same ‘9 to 5’. This will not only solve the problem but also lesson the trouble at the workplace. Working from different places provides various benefits. Commuting and telecommuting has firmly taken a position in the market. It benefits both the worker as well the employer. Let us simplify it with an example. For example, you have been having recurring backaches. These aches are worsening due to travelling in bus or car to and fro from the work. However, you are a brilliantly qualified worker. At such a point you can request the employer to provide accommodation requesting for work from home or work from distance. By this commuting may reduce and help you take care of the work along with your health. What is a trigger? A trigger is something that sets in motion an event or action (negatively). Usually our actions are a reaction of the trigger. For example, anger is a reaction of failure, frustration and disappointment. For some people it is not the frustration that brings out the problem. Instead, it is the loud noise that brings the headache and all the irritation. This irritation on regular bases can give home to less productivity and more environmental issues between the coworkers. At such a time, the employee has the right to approach the employer regarding the problem and try to come with a possible solution. For example, if headache caused by the loud noise is the problem, then you can treat it by asking to shift your work area at a place with lesser interference. Depending upon the problem the solution can vary. However, this situation is appropriate to ask or request for workplace accommodation. There are various other situations that might be appropriate to request the service. However, one should not forget that the employer has the right to deny or reject your request. Your request does not oblige the employer to grant the permission for everything you ask. Unless you provide a loop free and genuine request you might have 50-50 chances of denial. In addition, you should be aware of various things and rules that are related to accommodation providence. Below I shall provide step by step points that you should follow in order to properly request workplace accommodations without getting into any legal or other troubles whatsoever. The following steps may make things easier to work. Accommodation is an utmost requirement to the one who truly needs and/deserves. However, before applying one should start with the knowledge of whether the need is considerably reasonable to the employer or not? Often people complain about the employer being a mean, arrogant person who does not consider anyone. This is typical complaint from the people who are rejected for any accommodation. But I suggest for you all to take a moment and think about whether your reason was considerable to provide accommodation or not. According to the American With Disabilities Act (ADA), people with disabilities can demand for adequate accommodation from the employer. If the employer fails to provide the accommodation then you can also take legal actions against him. The topic itself clearly highlights the fact that the disability should be verified under the law. Disability, according to the ADA is a condition in which the person is restricted or limited to perform a certain task due to a problem or condition. However, if with the help of the accommodation he or she can perform the given task, then he or she is verified for the accommodation request. Verification of the eligibility within the government clauses is not limited to the employee. There are rules that do not apply to a certain group of employers too. The employee of a private organization with less than 15 employees is not subject to the rule of accommodation providing. If at all you work at a private organization with less than 15 people along with you then you cannot apply or request for accommodation. Accommodation is an aid that enables a disabled person to seek equal working opportunities without any discrimination. An accommodation request may also be counted as unreasonable if it levies hardship onto the shoulders of the employer. Let me clarify with a few examples of the reasonable accommodation and unreasonable accommodation requests. Reasonable accommodation requests are the ones that actually simplify the task performance of the disabled or needy. For example, the work schedules elasticity, medical/maternity leave, workplace or the work cabin placement, etc. Unreasonable accommodation requests are the ones that do not have any connection with the task performance in the workplace. These can vary from the request to lessen the workload to higher salary demand (on the basis of medical reasons), equipment to ease the day to day life. These are unreasonable demands to which the employer has the right to deny. At times people almost receive a panic attack while thinking about the possible reaction of the ‘furious’ employer on receiving the request. To be honest, some people also spend hours searching on Google to come up with a perfect format and heavy language to impress the employer. However, they all forget the two important things that are simplicity and straight to the point talk. For a businessman who runs busy all day long working from one meeting to another, it is a horrendous task to go through a literature piece in the name of application/request. Your letter or application should be very simple. As a fact, it should be as simple as a face to face talk. You do not need to mention the Acts and clauses that stand in your favour. Tip to remember – It may be possible that you might not need a written application. A verbal talk with your employer might do your work too. However, always keep a written copy with the date of when you are approaching the employer. This might come in handy when a certain dispute regarding your approach comes up in the future. A right to accommodation has no loopholes for the applicant. No rule/law obligates the employee to disclose his or her disability at the time of recruitment or hiring. It is entirely on the employee to disclose this piece of information. If a qualified employee discloses a disability later, he or she is still eligible for the accommodation from the employer under ADA. Remember when you were young and asked your mom for some money? The first thing that she would ask was ‘why?’ Similarly, the employer here would also like to know why you want him to do something for you. If you had asked your mom for money to buy a toy she would instantly deny your request (knowing you already have enough). However, if it were a school project she would gladly hand you some money. Similarly, let your employer know the reason as to why you deserve a bit of accommodation from his way. No solution may appear out of blue. If you have a problem then you need to search for a possible solution. When you approach your employer or the boss you should put forth the possible solution too. For example, you are using a wheelchair in your office. However, the wheels do not work properly anymore. Here you can requests for a new wheelchair or if it is possible you can ask your employer for repair. The employer may do whatever he seems fit. Many times the employers do not cooperate with the disabled. Instead, they retaliate with these workers. This retaliation is in the form of less salary, resignation offer, demotion, etc. Demanding recurring meetings on the same issue or avoiding the issue altogether is also a form of retaliation. If you at all feel like you are suffering from retaliation then keep all the documents and proofs up-to-date. This is when the written copy of your request may also come as handy. These proofs may make it easier to approach the attorney for justice.